The Hanseatic League was a group of trading guilds (Hanse) that existed during the 13th – 17th centuries. The purpose of this league was to maintain a trading monopoly over Northern Europe, in particular the Baltic Sea and the North Sea. While the League disintegrated in the late 16th Century, three of its cities, namely Bremen, Hamburg and Lübeck, remained members until the League’s final demise in the mid 1800’s. To this day, these three cities still refer to themselves as Hanseatic Free Cities. From a culinary perspective, membership of the Hanseatic League, with its extensive international trading network, provided a wealth of luxurious, foreign ingredients. These ingredients were otherwise unavailable at that time, which lent a foreign flavor to the Hanseatic food. This had the effect of distinguishing Hanse cities from the surrounding regions of Schleswig-Holstein, East-Friesland, Mecklenburg-Western Pomerania and Lower Saxony, all of which make up Northern Germany. Bremen and Hamburg are both cities and federal states. 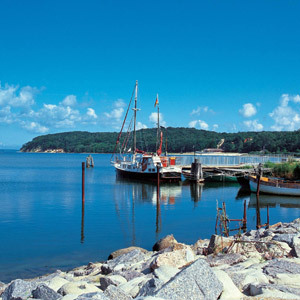 They are the smallest federal states in Germany in terms of area. Bremen is the smallest, and Hamburg is the third smallest in terms of population and their main contribution to the economy is derived from their respective sea ports. The state of Bremen is divided into 2 cities, namely Bremen and Bremerhaven, which lies about 37 miles to the north. The port at Bremen employs one third of the city’s working population. Hamburg’s port is equally important to the state’s economy, although other major companies such as Airbus and Otto Versand, plus many of the major oil-refining companies, are also located here. 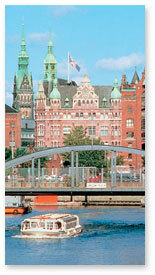 Bremen and Hamburg are two of the five states in Germany that border the coastline of the North and Baltic Seas. It’s no surprise, therefore, that the regional cuisine has a heavy seafood influence! This influence is so great, that northern Germans are often given the unflattering nickname of Fischköpfe (fish heads). However, there’s more to the cuisine of Bremen and Hamburg than just fish! Undoubtedly the three Hanseatic cities of Bremen, Hamburg and Lübeck had herring to thank for the huge fortunes amassed during the League’s trading heyday. North Sea fishermen learned the art of salting fish to make it last, and salted herrings soon became a staple foodstuff! To this day, one of the most popular dishes in northern Germany is Bratheringe (fried and marinated herrings). Braunkohl und Pinkel (cabbage and sausage) is probably one of Bremen’s most well-known dishes! In most of northern Germany, the dish is called Grünkohl und Pinkel (kale and sausage), however, the Bremer version of the dish uses a variety of Grünkohl whose leaves have a reddish pigment in them, which, when cooked, impart a brown color and more spicy taste, hence the Braun (brown) in Braunkohl. The oddly sounding Pinkelwurst is a smoked sausage made with pork, groats (oats and barley), suet, onions, salt, pepper, pork fat, bacon and other spices. The exact recipe differs from sausage maker to sausage maker, who keep their individual recipes secret! is a traditional northern German dish that originated as a meal for sailors onboard large sailing vessels in the 18th century. It was originally made with salted beef (Pökelfleisch), since it kept well without refrigeration, potatoes and onions. Today’s variations are made a little finer by using cured or salted beef or corned beef and by adding beets, potatoes and herrings. 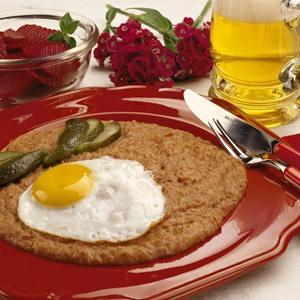 Hamburger Aalsuppe is another popular dish in the region! Given the influence of fish in North German cuisine, one would assume that Aalsuppe would be exactly what it describes, namely a soup made with eel (Aal means eel and Suppe means soup). While you’re indeed likely to find eel in an Aalsuppe in Hamburg, the name actually refers to the fact that this soup contains alles or everything! Originally a stew, Aalsuppe is made with meat bones to create a broth (ham hock or chicken parts for example), dried fruit to give a slightly sweet taste, stew vegetables, vinegar to give a sweet and sour taste and a variety of herbs such as parsley, thyme, marjoram, sage, chervil, mint, dill, sorrel and basil. Some recipes also add dumplings! While Aalsuppe does not necessarily have to contain eel, most recipes these days add pieces of smoked eel or eel cooked in wine to prevent tourists complaining about false advertising! Monkfish can also be substituted for eel, as it is common in the region! 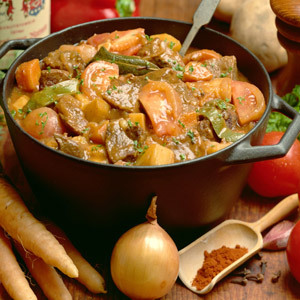 In Northern Germany, National refers to any stew whose main components are pork and root vegetables. The Lübecker National, a common stew, is made with pork belly , carrots, potatoes, and onions. The Hamburger National, on the other hand, is made with rutabagas instead of carrots! Rote Grütze is another dish that’s not quite as it sounds, but still delicious! Literally translated the words mean red grits or red groats. While the original dish was indeed made with grits/groats and red fruit juice, the recipe has been adapted to a more palatable and lighter dish. Today it is made with summer red berries and thickened with cornstarch or sago instead of grits. While there are many ways to make Rote Grütze, the classic recipe uses Sauerkirschen (sour cherries), red and black currants and raspberries. Bremer Klaben is the Norther German version of Christmas Stollen that dates back to the mid 16th century during the height of the Hanseatic League. During this period, the League allowed the bakers access to the exotic ingredients traded by its member cities. A Bremer Klaben, like the Stollen, is made with sultanas or raisins, flour, butter, sugar, orange and lemon peel, rum, almonds, yeast and salt. 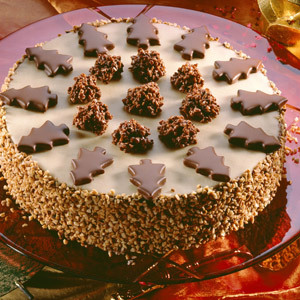 This specialty is usually baked at the beginning of December and in such quantities as to last until Easter! Unlike Stollen it is not dusted with confectioner’s sugar after baking. Plettenpudding is a dessert that consists of layers of macaroons, raspberries, sponge cake (or lady fingers) and custard! It was made famous in the novel Buddenbrooks, written by famed German author Thomas Mann. Bremer Butterkuchen (Butter Sheet Cake) is also known as Zuckerkuchen (Sugar Cake), Beerdigungs-kuchen (Funeral cake) or Freud-und Leidkuchen (joy and sympathy cake) since it is often served at weddings and funerals. It is sweet and helps to lessen the sting of sadness. The medieval town of Lübeck in the state of Schleswig-Holstein is considered to be the Queen of the Hanseatic League. The landmark 15th century fortress with its twin towers, known as the Holsten Gate, is evidence of the town’s military strength and its role as the capital of the League. The city’s most famous culinary treasure is the world-renowned Lübecker Marzipan. Lübeck considers itself to be the world capital of marzipan and is home to two of the most well-known marzipan producing companies, namely Niederegger and Carstens! Lübeck is also famous for its wine! Lübecker Rotspon was the method of shipping young French Bordeaux wine to Lübeck and Bremen to be matured, bottled and shipped (mostly to Russia) and began in the early Hanse years of the 13th century. Although it did not gain great importance until the 16th and 17th century, it created amazingly flavorful wine! The resulting matured wine, known as Rotspon, was immortalized in Thomas Mann’s novel Buddenbrooks.